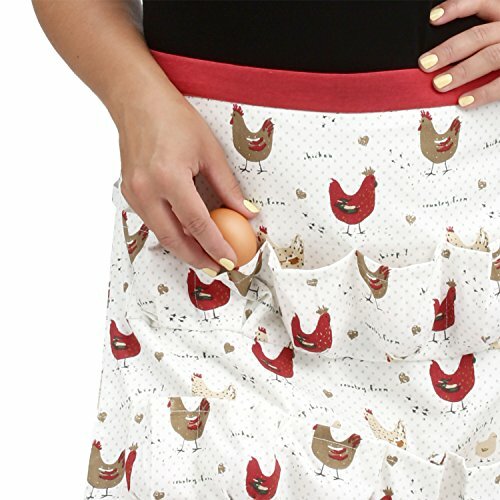 Whether you have a simple backyard coop or a small farm, our egg gathering apron means no more baskets or juggling eggs. Collect your eggs in style with our fashionable and functional alternative. Twelve individual double stitched deep pleated pockets to keep your hands free and your eggs safe. Whimsical chickens adorn the apron with contrasting red waistband and ties..
Made from the highest quality 100% Indian cotton, our apron is fully lined and designed for long lasting wear. Sturdy and generously sized, our apron measures 20 inches wide by 18 inches tall with oversized ties to fit most - 96 inches from end to end. Machine washable for easy care and cleanup, this quality stitched apron will provide years of daily use. If you have any questions about this product by Cackleberry Home, contact us by completing and submitting the form below. If you are looking for a specif part number, please include it with your message.